What is open format DJing? When you are applying for DJ gigs you will often see jobs posted for open-format DJs, but what are they? An open-format DJ is someone who plays a mix of many genres, rather than just one single genre like House or Techno. In general, in the UK, when someone is looking for an open-format DJ, what they really want is a DJ who spins a mix of hip-hop, R&B, classics and chart music. Of course, nowadays most of the chart is actually dominated by pop, R&B and hip-hop music, and many clubs and bars simply want to play what the audience knows well. Depending on the event, you might also be expected to mix your chart selections with more niche genres like latin music. There aren't any rules to what you can and cant play, as it very much depends on the crowd. A good open format DJ will read the crowd and react to what the audience responds too in real-time. You might find your set goes in an unexpected direction, so you need to be prepared for anything and be confident to switch the style entirely if the audience is not liking the tracks. Make sure you have a huge and well organised music library ready to rock any dance floor. 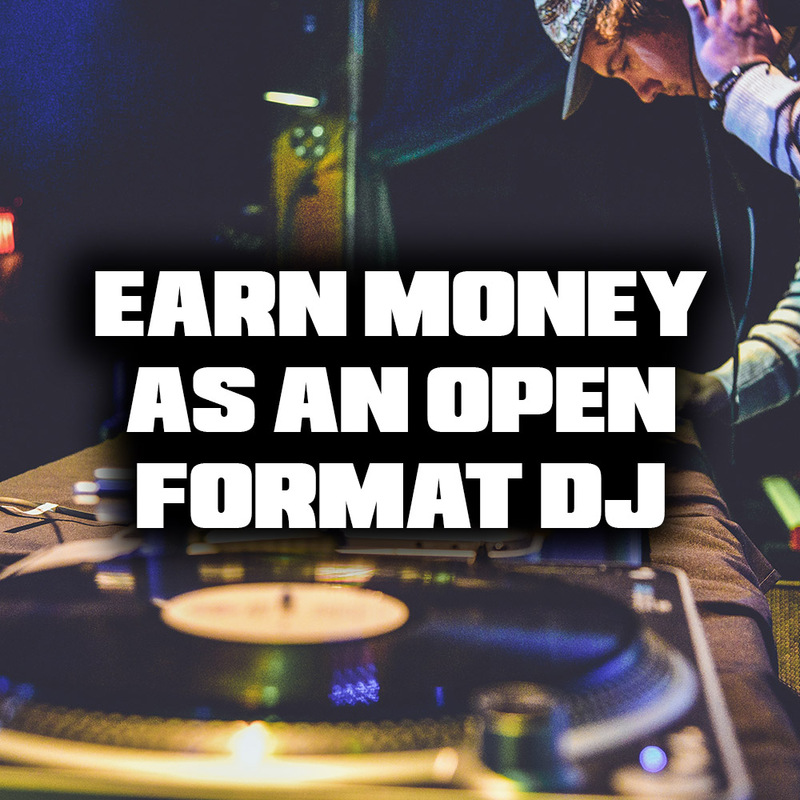 A lot of DJs shy away from playing commercial music for many reasons and that means open-format DJs are in demand, and money can be made! Firstly, it's actually a lot harder to mix correctly than DJ friendly genres like house music, with its long intro and outros. Radio edits are harder to mix together and require the use of many skills like turntablism, looping, sampling and more to make a creative transition sound good between two chart songs. If you can master this skill and play for an audience rather than yourself, you can make some good money being an open-format DJ. Top Tip: Think of your set in sections, have a 20 minute hip-hop section, 20 minute chart section and a 20 minute classic section, then just join the mini-sets together. Usually events with open format DJs will only have one or two DJs for the entire evening, leading too much longer set times that are on average three hours long. Be prepared to play extended sets, in some cases the entire evening. This is often why a laptop is preferred over a USB/CDJ set up. Even with a USB full of well organised playlists, a laptop will always come up on top when it comes to being able to access songs instantly. The audience will often ask for song requests on the night. The best way to deal with this is to have a clipboard, paper and a pen attached by a piece of string. When someone requests a track simply hand them the clipboard so they can write it down so you don't get bothered trying to hear someone above the music. Venues will expect the open-format DJ to play appropriate requests so you'll be expected to have a vast music library of popular and classic songs. Top Tip: Why not get them to write down their email address and join your mailing list why they request a song? DJ Yoda is a highly skilled open format DJ with a vast knowledge of specialist and commercial music. He would be just as comfortable in Fabric room one as he would be playing at Cambridge University fresher week balls. Another good example of an international open format DJ is ATRAK first gaining recognition on the turntablist scene before being picked up by Kanye West. If you would like one-to-one lessons on open format DJing just click here to book open-format lessons at London Sound Academy. We can teach on Serato, Traktor and Rekordbox! Don't forget that LSA graduates get DJ gigs on graduation, including some paid open-format gigs.